Dehydrated skin. Pigmentation. Dry skin. 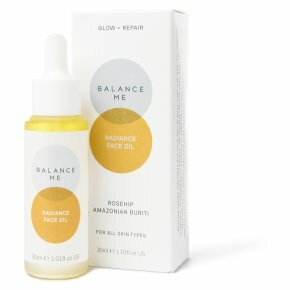 100% Natural.A plumping and soothing face oil rich in essential fatty acids to firm and hydrate. Designed to address uneven skin tone, this 'dewy skin in a bottle' will add radiance to dull and tiredg skin. Key Ingredients: Amazonian Buriti Nut A natural anti\u2011inflammatory, rich in essential fatty acids which helps to improve skin's elasticity, firmness, hydration and tone. Benzoin An ancient resin favoured by ancient cultures for its embalming and calming properties to preserve and soften the skin. Yarrow A powerful healing herb with softening, anti\u2011inflammatory properties. Free from parabens, dea, mineral oils, sulphates, pegs, petroleum, silicones, propylene glycol, microbeads, artificial fragrances and colours. Directions Warm two drops of oil in clean palms and massage using gentle circular movements across a cleansed face, neck and décolletéeach morning and evening.